DO-17100-03 was succesfully added to your cart. If I record all 4 channels for 3-4 hours, how can I extract the data to a pc into a graph? Can I extract the data via a usb cable? This part number is specifically for the A2LA endorsement tag that would be an additional add-on separate from an NIST calibration certificate. This part number is not for an item itself. Is your standard NIST calibration certificate for Temperature and Humidity? This is the A2LA Endorsement part number and not the part number for the NIST traceable calibration report. The A2LA Endorsement is add on to the standard NIST-traceable Certificate. 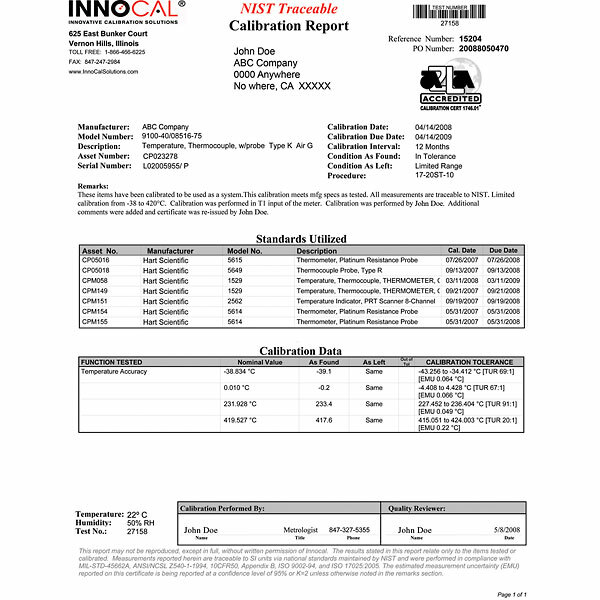 The standard Innocal NIST-traceable Certificate does not include A2LA endorsement, and must be ordered in addition to the standard certificate. for eg, 25" steel rule calibration cert., how long is it good for? This is up to you and your protocols. Usually the length of time is 1 year, but if your protocols call for calibration once every few years, we can write the expiration date to reflect any length of time you require. What is the traceable accuracy of the process and the stated uncertainty? Are the incoming and outgoing data presented on the certificates? This item is an A2LA accreditation fee. This would be in addition to a NIST traceable certificate. All of the NIST calibrations will show all of the calibration points and the results of each point. I would like to order a thermohygrometer (EW-03313-85) that is NIST traceable and calibrated to ISO 17025 accreditation requirements. Can you please supply the part numbers I will need to order? The product 03313-85 does include a certificate of NIST traceability from the factory. If you want a more detailed calibration service at the time of your order (including test points) from our ISO 17025 accredited lab, you can also order part number: 17030-20. Overall painless process. Representatives were knowledgeable and helpful. I send equipment tool again.